In his mind, the “special interests” controlled the agenda in San Diego. From the big developers to the big hoteliers, the perception has long been that the wealthy and powerful of this city have enjoyed an outsized influence over City Hall. The City Council and the Mayor’s office have often been viewed as nothing more than a rubber stamp for their agenda, which has focused primarily on Downtown for at least the last two decades. That would change under a Bob Filner administration, he promised. The focus would be placed on what was good for the city as a whole, not just what worked best for private business interests. It was an interesting campaign promise that many believed was nothing more than lip service; the kind of things politicians often say in order to impress the voters. But once in office the power brokers would again undoubtedly resume their place at the top of the hierarchy. That’s the way it’s always been done. No real reason to expect that to change. Besides, their candidate was a shoo-in to win anyway. This Filner guy didn’t stand a chance. No worries. Doug Manchester—with his newfound media influence—barely broke a sweat. His massive Navy Broadway Complex was sure to be given a full and enthusiastic green light when his guy got elected. Turns out that Bob Filner doesn’t care much for lip service. And as the folks down at City Hall are beginning to figure out, when he says something, it’s a pretty safe bet he means it. “I’m all about putting power back into communities and away from where it’s been for many, many decades” Filner said at a debate with his general election opponent, Carl DeMaio last August. Throughout his first four months in the mayor’s office, Filner has stood steadfast on his principles, and he refuses to be pushed around by the usual suspects that are used to getting their way down at City Hall. That includes the City Council. And if there were any doubts about his intention of following through on that campaign promise to stand up for the “little guy,” let them be gone once and for all. “The people who are resisting change don’t realize that I meant my campaign promises,” Filner said in an interview last week. It was that showdown on the Tourism and Marketing District funding that demonstrated just how intent he is on changing the culture of San Diego city government. It was a dispute with clearly delineated lines in the sand, with the mayor waging a lonely battle against not only the private hotel interests that control the Tourism Authority these days, but against the City Council as well. In the end, Filner wound up getting the most important of his list of demands, including strict protections for the city’s general fund, and a commitment of funding for the Balboa Park Centennial celebration. He also secured a commitment from City Council President Todd Gloria to delve further into an expansion of the living wage ordinance in the near future. Filner wanted greater transparency on the part of the TMD board, and he got it. Just two days prior to the March 28 special meeting of the City Council, the Council demanded that the Mayor sign the agreement they had crafted back in November, without Filner’s participation or input. There would be no modifications, no negotiations. The resolution to force Filner to sign the existing contract passed via a 7-1 vote. Then, only two days later the two sides met again in a veritable love fest to approve a new compromise document. To this day no one on the City Council has been able to articulate why it was so important to have this fight, particularly given the outcome. “They were going to show me my place,” the Mayor said. It didn’t work, though. If anything, this mayor is even more emboldened to stick to his metaphorical guns. 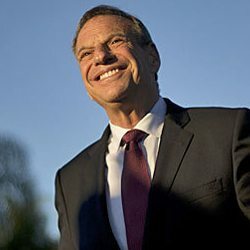 Filner, in fact, has been on the winning side of several conflicts that pit him against the City Council (and in some cases the City Attorney), including legal battles over the Balboa Park renovation plan and the Public Employee Relations Board ruling against Prop B.
Filner’s first four months in office, in fact, have been among the most turbulent in memory. But change doesn’t come easy, or without a fight. And Filner has demonstrated that he has plenty of fight in him, even if it’s not the most desired method of accomplishing a task. Only time will tell if the change Filner is seeking to bring about is on the right side of history. Great piece, Andy. Whether Filner is on the right side of history or not depends on us “regular” citizens. He promised to help us so we have to help him. Mayor Filner is keeping his campaign promises to end homelessness. Visit these links, which the editors at SDFP were kind enough to embed so my comment doesn’t ruin the layout of their front page. I have a question, about how the police are treating homelessness today. In my neighborhood, west Clairemont, the police have been conducting sweeps – the paddy wagon at 7 am arresting and charging people. People sleeping in Tecolote Canyon and been evicted; officers walk the street and parking lots looking into cars, citing or arresting those found sleeping in cars. The District Attorney is following through and prosecuting these cases. This is what my neighbors are talking about. I wonder if Mayor Filner is aware of what the police are doing? Filner is no radical. But the more I see him taking on the entrenched business interests here in San Diego the more I like him. Thank goodness Mr. Filner was elected. How could the election even been close. It is disturbing to imagine what that moron DeMaio would be doing for the rich and powerful at the expense of the working 98% of the people of San Diego. I am hopeful this portends a new day for “We the people”, but we have to strongly support Mr. Filner and his agenda and pay attention and vote out the conservative remnants of the past. San Diego could go take the progressive enlightened route of Portland Oregon, or the city of Santa Monica in terms of intelligent and progressive city planning and obeying Laws such as the Clean Air and Clean Water Act that up till now San Diego has ignored. For example in our so called sewage treatment which really just flushes near raw sewage directly into the coastal waters off Point Loma, in violation of the Clean Water Act, but which is fine according to the actions of all the previous mayors and city power brokers.